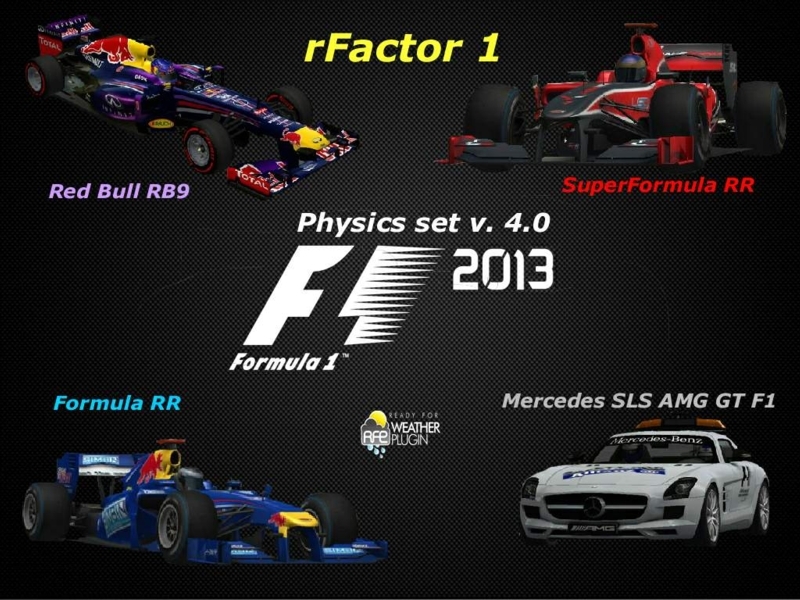 This is a complete physics set ( Physics file, Suspension file, Engine file, Tyre file, damage file ) for a F1 2013 model in rFactor 1. The files are made to be used in any F1 2013 Mod, especially Mods for Leagues, since the set is including tyres ready for RFE plugins, featuring new Pirelli 2013 specifics. Improved Tyre files, featuring Pirelli 2013. Updated Talent files for F1 drivers, on the base of the final F1 Championship results. complex for the Mercedes SLS AMG, FIA Safety Car. Updated link for a new Demo Pack version. Demo Pack includes the following models from RMT F1 2013 Mod ( See Credits inside ): F1 2013 Red Bull RB9, with rear pull rod suspensions ( The First and the original ones ); Ferrari F 138, with Front and Rear Pull Rod suspensions ( The First and the original ones ); “Formula 2013” with traditional suspensions ( car based on Marussia MR02 model, with fantasy skin as “Vaillant F1 “ for Michel Vaillant ). Mercedes SLS AMG GT, FIA Safety Car. Updated Physics model for Formula 1 cars, featuring all Rear Pull Rod suspensions, and for some models ( Ferrari and McLaren ) also Front Pull Rod suspensions; Updated Formula Model with traditional suspensions. Updated all F1 2013 Teams in engine files in order to reflect values seen at GP of Singapore; updated Talent files; added AI autocalibrated files also for F1LRClub track Pack. Improved Tutorial “How to….”, for the correct use of files; Updated links for Demo Pack and F1 2013 Mod, with my Single Player files. Demo Pack includes the following models from RMT F1 2013 Mod ( See Credits inside ): F1 2013 Red Bull RB9, with rear pull rod suspensions ( The First and the original ones ); Ferrari F 138, with Front and Rear Pull Rod suspensions ( The First and the original ones ); “Formula 2013” with traditional suspensions ( car based on Marussia MR02 model, with fantasy skin as “Vaillant F1 “ for Michel Vaillant; Mercedes SLS AMG GT, FIA Safety Car. If You want to test directly in a F1 Mod my files, adapted to a Single Player version Mod, read please the included document called “F1 2013 SP Mod” for the download link. 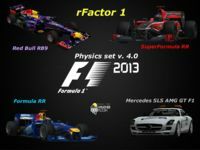 These files are made to be used in any F1 2013, or any other Formula Mods, especially for rFactor Leagues, since the F1 set is including tyres ready for RFE plugins, featuring new Pirelli 2013. Link not working .... have reported ... if poss someone could email or post file. This is a lead mine and my friend's Portuguese Nuno Vilela. It is located in the state of Ceará brazili and are always performed with open wheel racing and touring cars Brazilians. Es la nueva version de la antigua "Calandria Park Speedway". tiene camaras. es mas realista comparada con la version 0.91. La pista esta ubicada en Australia. Is the new version of the old "Calandria Park Speedway". Has cameras. Is more realistic than 0.91 version. The track is ubicated on Australia. Autodromo di Mores is located in Sardinia, Italy, and is a short track ideally suited to the lower speed cars like the Clio, Skip Barber, etc.